With a shortage of housing and high land prices everywhere, subdivision continues to be an excellent investment, particularly if your property has been up-zoned. However, if you’re not an expert planner, subdividing your land can get really expensive really quickly. Legal and Council requirements, issues with services, and/or neighbours may need to be resolved – all of which (and more) we can help you with. Talk to us about what’s possible – you may be able to do more with your property than you thought! Download our Subdivision Guide NOW! 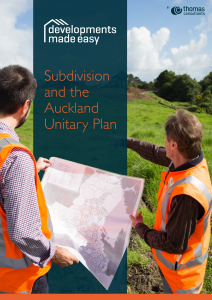 In this guide we talk you through all you need to know about the Subdivision process and how it relates to the Auckland Unitary Plan. Please fill out your details to download the guide. You can release value in your property now. Talk to us about developments made easy.